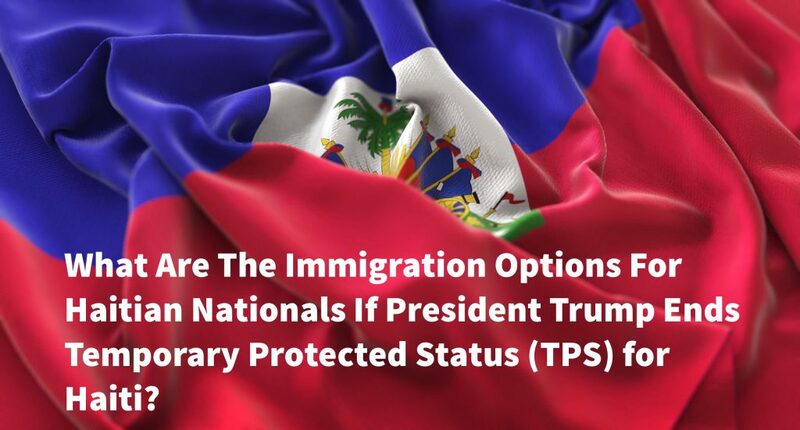 What Are The Immigration Options For Haitian Nationals If President Trump Ends Temporary Protected Status (TPS) For Haiti? USCIS, the government agency in charge of handling Temporary Protected Status (TPS) recently recommended to President Trump that he end TPS for Haiti. On April 10, 2017, USCIS sent a formal memo to John Kelly, the Secretary for the Department of Homeland Security, concluding that the country conditions in Haiti no longer support its designation for TPS. This is very scary news for the 58,700 Haitians currently in the United States under the safety and security of TPS status. Haiti’s current TPS designation is set to expire on July 22, 2017. What can Haitian nationals do both before and after July 22, 2017 to prepare for losing TPS status? —consult with an experienced immigration attorney NOW! 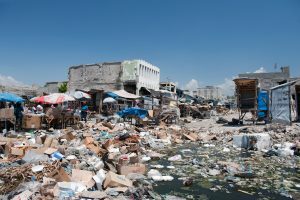 What is TPS and why does Haiti have it? TPS is a law that allows any president to designate a country for temporary protected status due to extraordinary and temporary conditions resulting from national disasters and internal conflicts (among other things). TPS allows people from that country to remain in the United States legally, apply for a work permit and live here safely, rather than having to return back to their country. TPS provides lawful status to people displaced from their countries due to natural disasters like the earthquake that ravaged Haiti. Following the devastating magnitude 7.0 earthquake that struck Haiti on January 12, 2010, former Secretary Napolitano designated Haiti for TPS on January 21, 2010. Under President Obama, the government extended TPS multiple times, but President Trump appears ready to end TPS for Haiti. The decision on what to do for Haitian TPS is expected to come around May 22, 2017. To be eligible for TPS under Haiti’s designation, along with meeting the other eligibility requirements, individuals must have continuously resided in the United States since January 12, 2011, and have been continuously physically present in the United States since July 23, 2011. To be eligible for TPS, applicants also must not have been convicted of any felonies, or two misdemeanors. Applicants for TPS must also not be removable from the United States for any reason other than not having valid documents or for not having entered the country legally or for having overstayed their visas. While USCIS suggested that the President end TPS for Haiti, they also recommended that he delay the effective date of the end of TPS from July 22, 2017 to January 22, 2018. They suggested this delay to allow for an “orderly transition before the TPS designation of Haiti would terminate.” This is good news for Haitian TPS recipients. This means that employment authorization and TPS status may be automatically extended through January 22, 2018, but then end on that date. This gives many Haitian nationals about seven months from right now to either pack up their things and get ready to go to Canada, another country or return to Haiti. But if you are a Haitian national, and you are not ready to leave the U.S., you do have other options. What are my other immigration options if TPS for Haiti ends? If you were admitted or paroled into the United States before you received TPS, or while you had TPS, you may be eligible to adjust your status through a U.S. citizen spouse, adult son or daughter or parent (if you are a child). Under certain circumstances, you may be able to adjust status through a Lawful Permanent Resident Spouse or Parent, or a U.S. citizen sibling. To find out if you are eligible, consult with an experienced immigration attorney today, don’t wait until TPS is over, as it may be too late by then. If you have been the victim of certain crimes in the United States and have suffered physically or emotionally because of it, and you have been cooperative with law enforcement, you may be eligible for a U Visa. To find out if you are eligible, consult with an experienced immigration attorney today, don’t wait until TPS is over, as it may be too late by then. If you were or are in removal proceedings (immigration court), and your case was closed, you can go back to court and apply for any form of relief from removal for which you are eligible. This may include asylum, withholding of removal, cancellation of removal or others. To find out if you are eligible, consult with an experienced immigration attorney today, don’t wait until TPS is over, as it may be too late by then. If you have never been in immigration court and have a fear of going back to Haiti because of past persecution or a fear of future persecution, you may be eligible to apply for asylum and/or withholding of removal. Normally, you have to apply for asylum within one year of entering the U.S., but there are exceptions. Applying for asylum can also come with a new work permit when the TPS work permit is taken away. Asylum is complicated and if you do not do it correctly, or for the wrong reasons, you can end up getting deported and barred from all forms of immigration benefits and relief from removal. To find out if you are eligible, consult with an experienced immigration attorney today, don’t wait until TPS is over, as it may be too late by then. Bottom line—even if the Government takes away TPS for Haiti, Haitian nationals are not without hope and not without other immigration options. The time to consult with an immigration attorney is now, don’t wait until TPS is gone, because some of your immigration options may be gone with it. Call and schedule a consultation today!